Valderrama, who does not have legal background, enlisted the unsuspecting non-profit to manufacture a legal opinion to back his policy that the city should keep ignoring traffic congestion because otherwise “the residents will be on the hook” to pay for fixing the roads. When MRSC gave him answers he didn’t like, Valderrama omitted those answers and cherry picked the ones he liked. This is the latest twist in the concurrency saga that has been consuming city hall for over a year. Concurrency is a legal requirement to prevent over-development, in which infrastructure is not keeping up with development impact. In Sammamish, years of deliberate manipulation of the concurrency program allowed development to run unchecked and for infrastructure to fall behind. Fixing concurrency will likely result in a defacto moratorium for years, given a 15 years infrastructure neglect. Valderrama made similar assertions to City Council in this presentation. Making it sound like he is looking for ways to limit growth without a valid reason. Valderrama never gives MRSC the real context to the situation in Sammamish: a massive shortfall of public infrastructure and misrepresents the consultants responses. “I think he wants to raise the LOS,” writes Oskar Rey, the legal consultant to his colleague. Reviewing the complete responses from MRSC, reveal a different picture than what Valderrama painted to council and the public. Valderrama then cherry picks specific lines from MRSC’s response to him and puts together a presentation he presents at a city council meeting. One of the questions Valderrama presents to MRSC is whether the city will “be on the hook” to pay for roads that fail concurrency as a result of changes to the standard. What Valderrama doesn’t tell MRSC is that he already asked City Attorney, Mike Kenyon, the same exact question and was answered during a council meeting (YouTube). “With respect to the first question below, are you aware of situations where a jurisdiction has been challenged for setting LOS too high? In my experience the situations come up at the opposite end of the spectrum where cities allow development to occur despite a failing LOS.” – writes Rey to his colleague Steve Butler. “I am not aware of any local governments, however, that have been challenged for having high LOS standards.” writes Butler, on March 28. At no point does MRSC takes any position on the specific situation in Sammamish. Nevertheless, Valderrama invokes MRSC in the debate as if a legal conclusion was made on the merits of correcting the concurrency manipulation and recognizing the inadequacy of the public infrastructure in Sammamish. as i said over facebook, again you misrepresent what was said. Not going into to go into the whole discussion with you because it’s useless, but to somehow suggest that development cannot be stopped under the “growth management act” if there is no infrastructure to support it is absurd. You want growth in Sammamish to continue without adequate public infrastructure and you claim the law supports your position. And i can go on and on…. Ramiro – stop with the games. you changed your mind and want development to continue even though the roads are congested? just say so. explain to your voters why they should support it. But stop hiding behind manufactured reasons. Whose cherry picking? And a mind reader to boot. Some might construe some of this content as defamatory. Unbelievable. Mr Valderamma is absolutely correct. Watch the Council meetings and draw your own conclusions. I doubt any of the Council members were mislead. I may not agree with all of them but I believe they are all smart enough to draw their own conclusions. Mr. Mullor, If your story is incorrect and it is based on falls information regarding Council member Valderama will question your credibility as you are feeding the residents of Sammamish fake news. In the future will no longer trust your publication. Maybe, we as residents should question your articles you put in print as unreliable. Mr. Valderama has always represented us being a sound person of credibility and honor. If you as Deputy Editor lower yourself to misleading representation will damage your profession. As a born and educated European find the Press in general here and abroad with very few exceptions propaganda organizations to destroy the facts hoping the public is stupid enough to digest the garbage. I do not see, Mr. Maine, how you reach your conclusions above. Mr Hamilton, I have to agree with Mr. Maine. The idea that if someone has a different opinion, they must support an extreme view is a tactic used to control the discussion and generate fear. I seriously doubt that Valderamma wants unfettered growth. If more citizens watch the Council meetings, they are going to reach their own conclusions. I actually believe that it has already begun. Typically there’s some truth in both perspectives but the problem begins when someone takes another’s perspective and defines as an extreme position. That is unreasonable. Having an independent opinion is one thing, going on the attack is quite another. Catherine, the issue is not the different views. Miki and I have very different views about the Town Center. 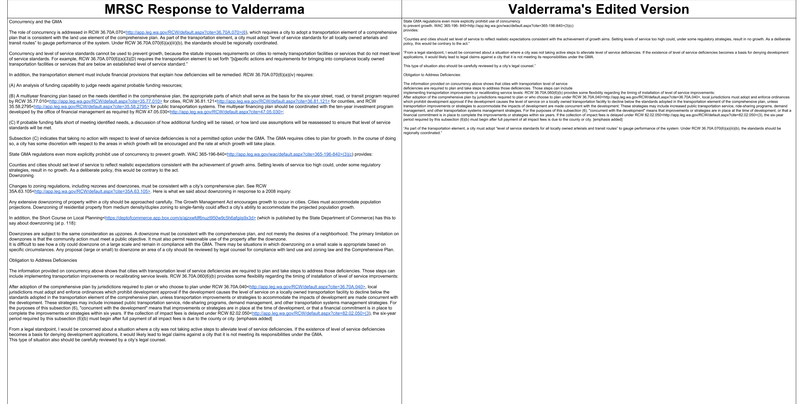 The issue is Valderrama’s history of distorting and even making up facts to support his views. In addition to his misrepresentations on the current issue, outlined in Miki’s post, Valderrama outright lied about what former City Councilman Troy Romero said with respect to Tom Hornish, as I documented; Valderrama outright lied in his assertions that he was promoting injection of storm water into the ground in the Town Center and tried to blame Karen Moran for “misunderstanding” the difference between injection and infiltration; he lied about environmentalist Wally Pereyra “supporting” injection when he did not; he lied about Moran, then a water commissioner, and Mary Shustov, another water commissioner, supporting injection when they did not; and the list goes on. His obfuscations, distortions, misrepresentations and falsehoods alienated his once-strong allies Malchow, Hornish, Ross, Moran, Muller and me (among others). Valderrama has aggressively supported growth in his second term. He has supported a staff and consultants whose manipulation of concurrency has been documented. He’s done a complete 180 from his first term for inexplicable reasons. I was a huge supporter of Valderrama. Before I went public last year with exposing the concurrency fraud, Ramiro was the FIRST council member I went to verify my findings with (along with Malchow and Hornish), trusting him for his pro-residence history. This is not about opinions. It’s about honesty and truth. For democracy to work, elected officials have to be above and beyond when it goes to truth and honesty. Ramiro is failing badly in the last year or so. For example, I do not agree with some of Don Gerend’s opinions – but I respected the honesty and openness he went about his agenda. Same goes for Paul Stickney – not a public official but certainly a pro growth activist – who is upfront about the financial interest he has in the growth he preaches, or your neighbor, Michael R., with whom i’ve had hours of genuine discussions with. jeopardizes you pro-Town Center agenda. I welcome a substantive debate but what you’re doing is the exact thing you accuse me of doing…. ironic. The story not only cites public records, it also includes a reference to the source materials so the public can verify. I take it you didn’t invest the time to go through it. You on the other hand cite no details, no support and no reasoning. Just throwing mud on behalf of your favorite politician. I take offense with your comments. I do this gig as volunteer on my free time, digging through thousands of public records and making sure EVERY WORD I write is twice verified to be true. Again, I challenge you to specifically point out a single proof to substantiate your harsh words.